Looking back, you could say it all started from growing up in the middle of nowhere listening to power poles. Putting my ear up to the wooden pole, I was compelled by its voices and the accompanying hum. The poles were probably conducting radio signals due to loose insulators, but at the time it was like a magical attunement, speaking only to me. That young girl, often called a “tomboy”, inhabited a gendered body just as her brothers did. We were all were gendered by expectations, roles and associated jobs. Growing up in a remote area, she posed questions to the landscape, seeking connections and identity. The power poles were the only line in or out down a no-exit gravel road, vulnerable to storms and trees falling on the lines, causing a break in the circuit. Thirty years later, I am still engaged in the practice of attunement or listening as a way of knowing and being in the world. Energy is a force, an all-binding, obvious but largely invisible process. Every sound we experience has been transduced, connecting us as humans — the “users” of mechanical and electromagnetic energy and all organic matter — to a larger energetic system. Video 1 (2:11). Research Action Venice was recorded by the Nine Dragon Heads Documentary crew for Data Processing System — A Sonic cartography of Venice, which was part of the group show “Jump into the Unknown” at Palazzo Loredan del’Ambasciatore, a collateral event of the 56th Venice Biennale in 2015. YouTube video “Charlotte Parallel — research action Venice 2015” (2:10) posted by “Charlotte p” on 22 July 2015. The transformation of energy that enables an interaction between different realities — or both sides of the transducer — is a primary motivation of my practice. To put this into a concrete sonic format, I walk around a place with my mobile sound kit to listen to and record sounds. My favourite DIY sensing tool is a light-to-sound transducer — a solar panel wired to an audio jack, which is then plugged into an amplifier. The solar cell can convert a time-varying light signal into a time-varying electrical signal. This small electrical signal can then be fed to an audio signal amplifier and is then converted into sound. 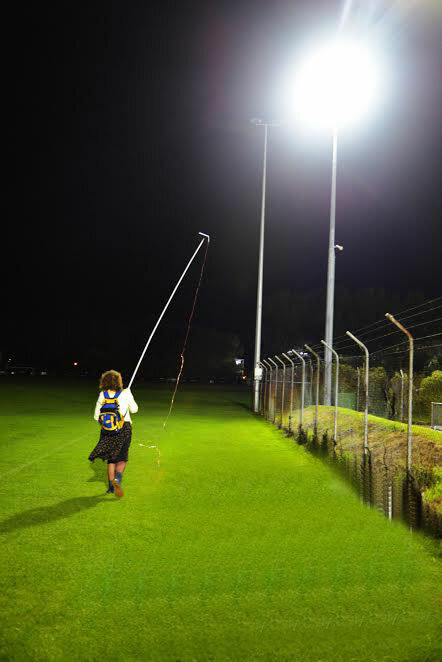 By walking around the streets with my DIY light-to-sound transducer, playing LED information boards, ATM screens, street lights and any other electrical networks, it is possible to listen in on the everyday use of our electrical energy (Video 1). As a research action, it often engages conversation and interesting reactions from people in the particular place. And more often than not, the presence of security officials! Site-oriented investigations are performative by nature, allowing for interactions within a site that inform the research. Site is recognized as an ongoing complex system of the social, geographical, biological, political and economic structures of a particular place. By working in situ I am saying that every point of the research activity embodies these structures, as a cybernetic system, modulated by feedback, that the listener or observer modifies and is modified by. Audio 1 (1:01). Excerpt of a recording made using a DIY light-to-sound transducer on the Kiwi Bank ATM in the Christchurch Container Mall for the interactive sound installation Ecologies of Transduction (2016), exhibited at The Auricle Sonic Arts Gallery in Christchurch (New Zealand) from 6–27 October 2016. Audio 2 (0:52). Excerpt of a recording made using a DIY light-to-sound transducer on the DBS ATM in Clarke Quay in Singapore. Research action as part of my residency at Singapore’s Instinc Gallery in 2017. Sensing the environment through the use of the solar panel directs attention to the electrical grid. The grid is the HQ, distributing power to smaller substations and domestic transformer boxes which then feed cables that traverse and intersect beneath and on top of the earth’s surface. Depending on the country you live in, you can hear the warm 50 Hz hum leaking from transformer boxes. Which brings about various questions: How is leaky signal intersecting with electromagnetic sources of both human and non-human kinds? What kind of new relational event is taking place? We engage with and rely on black boxes and electrical circuitry as part of our standard, day-to-day operations. Even though electrical processes of light provide us with crucial information, the presence of light itself often remains unquestioned, invisible by being embedded in the act of doing something else. Listening to light information could also be thought of as initiating a kind of energetic forensics that observes and considers “complex systems consisting of electronic, electrical, mechanical and physical components” (Dodge and Kitchin 2005, 163). Video 2. 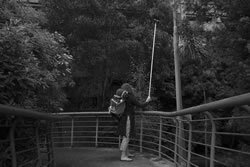 Excerpts from Charlotte Parallel’s contributions to When do the trees sleep?, a collaborative telematic performance with Jon He for Singapore’s Instinc Gallery in the context of an ASIA NZ Residency on 24 March 2017. YouTube video “When do the trees sleep? Charlotte Parallel INSTINC GALLERY” (2:35) posted by “Charlotte p” on 13 June 2017. Martin Dodge and Rob Kitchin also refer to the transfer of information between these objects as “coded processes where the flow of digital data flows between digital infrastructures” (Dodge and Kitchin 2005). Could the process of transducing the LED screen and listening to it act as the performative space between energy and the virtual? Placing my solar panel flat on the screen of the ATM (Audio 1 and 2), I am already part of the coded processes of surveillance. My presence has been detected, monitored and recorded for the time I am using it. The surveillance video recording becomes part of another information network or server that may be recalled and accessed at any point. If I were then to make a transaction, my bank card and PIN informs the relevant bank network. The bank network then uses this transaction to perform updates, send out statements in relation to the procedure of the time and, of course, relay the money. By performing these typical steps, I have participated in multiple coded processes that work together in the transfer of different kinds of information. Each part of this process involves a transducer that connects the individual to a complex system. Through the lens of Mackenzie, transduction suspends the present, in that it can keep receiving information without becoming something else. The transducer as an object brings together a collection of forces. Each side of the transducer represents a different energy form and corresponding reality that are brought together in a transformative field, initiating a new set of relations. What comes about cannot be predetermined but its “coming to be” can be traced, mapped, sensed, detected and transformed through the experience of listening to light. Dodge, Martin and Rob Kitchin. “Code and the Transduction of Space.” Annals of the Association of American Geographers 95/1 (2005), pp. 162–180. Mackenzie, Adrian. “Introduction.” In Transductions: Bodies and machines at speed. New York: Continuum, 2002. Charlotte Parallel completed her Master of Fine Arts at Otago School of Art in Dunedin (New Zealand). Her primary research interests are motivated by a need to understand how we exist in a continuum of and specific concentration within the electromagnetic field through our capacity as a transducer. 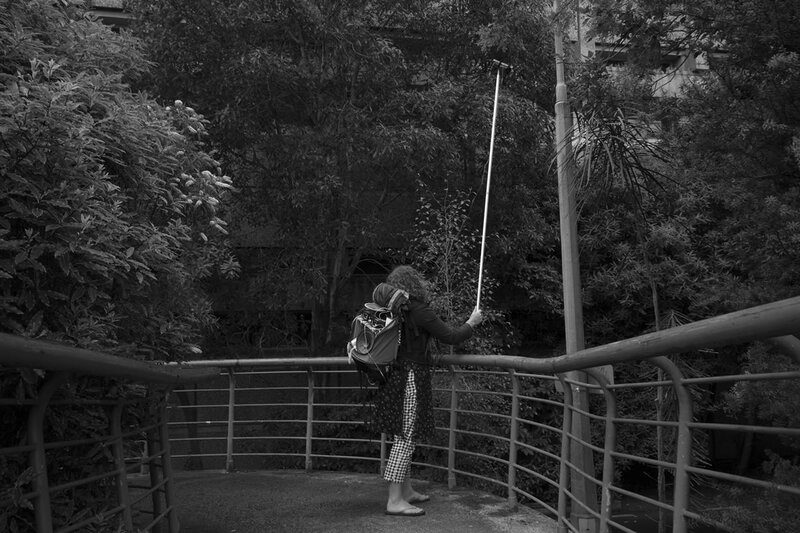 Site-specific research and temporal responses to site are her key methods to pose questions and test ideas. Parallel works within the fields of sculpture, sound, performance and collaboration.